With the Democrats retaking the State House of Representatives, the time has come for them to name new committees, and new committee chairmen and vice chairmen. Most of the designees make sense, at least from an expertise point of view. While I may disagree vehemently with Max Tyler on energy issues, his district includes NREL, and he’s made a point of being vocal on things like wind and solar subsidies. Instead, incoming Speaker Mark Ferrandino appointed a state rep whose main contribution to finance discussions has been to sue her own constituents, to seek the repeal of the Taxpayers’ Bill of Rights. She has historically found its spending and taxation limits to be antithetical to the idea of representative government. (Most of us see her opposition as a threat to the state’s solvency.) With the governor’s TBD Initiative coming up this year, it may signal an intention on the part of the Dems to wage war on TABOR more openly. Hint: Carry the two. Three hundred twenty-five. Ladies and Gentlemen, your new Finance Committee Chairman. The state’s in the very best of hands. We’ve pointed out some of the abuses of Certificates of Participation by the Denver and Jefferson County School Districts. However, there are times when COPs are good. One good use of COPs is as a cash management tool. Municipal bonds are usually non-taxable, which means their yields are lower than Treasuries of an equal term, especially in longer-terms, say, 10 years and over. Since a municipality doesn’t pay income tax, it can lend at the higher Treasury rate, while borrowing at the lower municipal rate, assuming that its credit rating is good. (I don’t care if Illinois has 30 years of gold stashed away, I’m not lending them a dollar for a hamburger to tide them over until next Tuesday.) The municipality can make a little reliable money on the arbitrage. In essence, this is a tax-shift. The Treasury isn’t collecting income taxes that bond holders would normally pay, so that tax money is, in effect, shifted to the municipality. It’s the reason that Treasury yields are higher in the first place. Over the last couple of years, though, this hasn’t really been possible. Municipal rates have stayed pretty steady, while long-term Treasuries have dropped precipitously as a result of all the various Quantitative Easings by the Fed. This has deprived municipalities of a source of cash. So while the stimulus was essentially a massive shift of debt from the states and municipalities to the Federal government, the feds are taking it back, inch by inch, by taking away this tax shift that had been available to the lower levels of government. I don’t think it’s coincidence that one of the tax loopholes being mentioned for closure is the municipal bond interest. The feds would like to make this tax shift permanent by pushing up municipal yields above Treasuries. Most of the focus has been on the fact that this would make borrowing more difficult and expensive for municipalities. But it would also close off this tax shift as well. Both these facts will have the effect of making states and municipalities more dependent on federal funds. Yesterday, I wrote about the Jefferson County School District’s use of Certificates of Participation to get around the State Constitution’s requirement for a public vote before issuing general obligation debt. I had forgotten that once upon a time, Denver Public Schools did almost exactly the same thing. The scheme – used widely around the state, and even by the state, is for the district to set up a corporation and then lease its own property back from the corporation, with the lease payments matching bond payment due on debt floated by the corporation in the public debt markets. The debt isn’t exactly unsecured – the school buildings themselves serve as collateral. But there’s no separate revenue stream dedicated to the lease payments, which come instead out of general fund revenue, the very definition of general obligation indebtedness that the constitution seeks to limit. In 2008, Denver Schools issued$750 million worth of both fixed- and floating-rate COPs, in order to recapitalize its own pension program, which had a $400 million funding gap. This was necessary for PERA to agree to absorb the DPS retirement system. While the ins and outs of the deal are beyond the scope of this post, suffice it to say that by 2010 the deal had become a key element in the Democratic US Senate primary between Andrew Romanoff and Michael Bennet, who had been Denver Schools Superintendent at the time of the COPs. Our concern here isn’t whether or the the deal was well-structured on its own terms. It may well have been, and has, at any rate, since been refinanced on terms more favorable to the District. The point here is that Denver Public Schools, in order to facilitate turning over the unfunded portion of its own pension plan to the rest of the state, issued what is general obligation debt in all but name in order to cover a shortfall. That debt, issued without public approval, now accounts for 37.6%, or 3/8, of the school district’s entire long-term debt. In the meantime, the burden of DPS’s unfunded pension liability has been neatly shifted onto the rest of the state. DPS may be required to step in with additional payments if an actuarial analysis shows that, in 30 years, the plan will be less sound than the rest of PERA. As of the 2011 CAFR, the plan’s fundedness had fallen from 88% to 81%, still the least-unhealthy PERA division by far. And the process of renegotiating what is likely to be, as with most public pensions, an unsustainable burden on the taxpayers, got much more complex with the addition of the state and PERA as explicit parties to the contract. 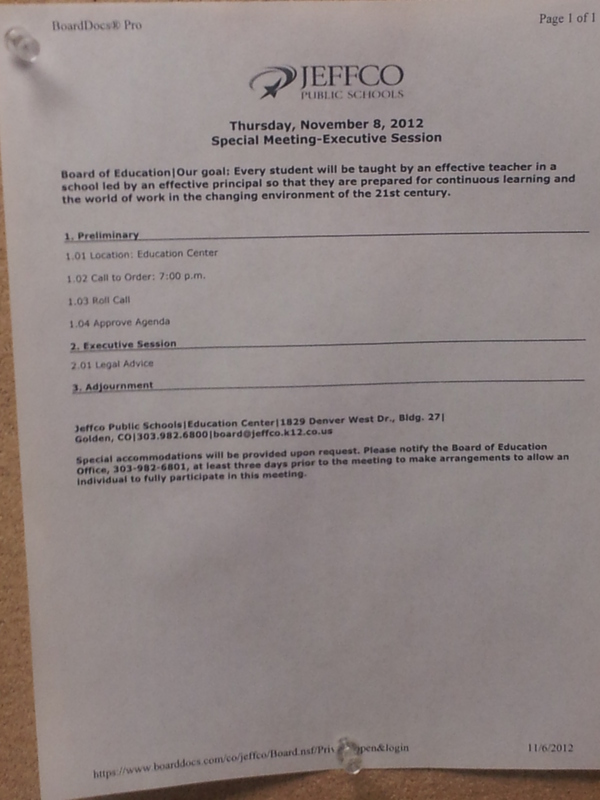 I’ve already written about the Jefferson County School Board’s decision to default on its Supplemental Pension Plan. It turns out it’s also using something called Certificates of Participation as a loophole to circumvent the State Constitution’s ban on governments issuing general obligation debt without a vote of the people. They’re not alone in this, and it can lead to a significant understatement of a government’s – thus the citizens’ – total indebtedness. In 2006, the JeffCo School Board voted to offer teachers the option of taking a lump-sum payment for the value of their pension benefit, or to stay in the 10-year payout program. In order to help capitalize the buyout, the Board issued $38.7 million worth of Certificates of Participation (COPs), with maturity dates from 2007 to 2026. Note that even if the Board succeeds in closing down the Supplemental Retirement Program and discharging itself of about $7.4 million of unfunded obligations, approximately $33.1 million worth of principle on those COPs will remain on the books. Since the State Constitution prohibits governmental entities from issuing unsecured debt without a vote of the citizens, how is such a this possible? Keep your eye on the shell with the pea. Technically, the COPs weren’t issued by the School District, but by a corporation, the Jefferson County School Finance Corporation. Nine school building were leased by the District to the Corporation for some nominal amount, and then leased back to the District by the Corporation. The lease payments by the District to the Corporation are designed to match the bond payments due by the Corporation. The bonds are therefore secured by the revenue stream provided to the Corporation by the lease payments from the District. What shows up on the financial statements of the District aren’t the COPs, but the lease payments, which are budgeted annually, not as a formal, long-term commitment. Investors, of course, are not fooled by this. The entire term of the lease shows up on District’s Comprehensive Annual Financial Report (CAFR) as a Capital Lease, as a long-term obligation (see Note 10, p. 66), not just the next year’s payment. They show up directly, as “Certificates of Participation” on the District’s Debt Capacity Schedule 9 (P. 114). If the payments are missed, it will damage the credit rating of the District. To be fair, JeffCo is far from the only jurisdiction to use this mechanism to get around the ban on general obligation debt. Denver City Council used a similar mechanism to launder its own obligations that it incurred when it backed debt for the Union Station redevelopment project, in order to secure federal funding. This appears to be a legal means of side-stepping the constitutional limitation. The State Constitution recognizes the danger inherent in debt, which is why bond issues need to be approved. If investors don’t treat the Corporation as a separate entity from the District in evaluating creditworthiness, why should the state? Neither the Lease nor the Certificates constitutes a general obligation indebtedness or a multiple-fiscal year direct or indirect debt or other financial obligation whatsoever of the District within the meaning of any constitutional or statutory debt limitation. Neither the Lease, the Indenture nor the Certificate have directly or indirectly obligated the District to make any payments beyond those appropriated for any Fiscal Year in which the Lease shall be in effect. Except to the extent payable from the proceeds of the sale of the Certificates and income from the investment thereof, from Net Proceeds of certain insurance policies and condemnation awards, from Net Proceeds of the subleasing of or a liquidation of the Trustee’s interest in the Leased Property or from other amounts made available under the Indenture, the Certificates will be payable during the Lease Term solely from Base Rentals to be paid by the District under the Lease. All payment obligations of the District under the Lease, including, without limitation, the obligation of the District to pay Base Rentals, are from year to year only and do not constitute a mandatory payment obligation of the District in any Fiscal Year beyond a Fiscal Year in which the Lease shall be in effect. The Lease is subject to annual renewal at the option of the District and will be terminated upon occurrence of an Event of Nonappropriation or Event of Default. In such event, all payments from the District under the Lease will terminate, and the Certificates and the interest thereon will be payable from certain moneys, if any, held by the Trustee under the Indenture, any amounts paid under the policy of insurance, and any moneys available by action of the Trustee regarding the Leased Property. The Corporation has no obligation to make any payments on the Certificates. On Thursday, November 8, the Jefferson County School Board voted to ask teachers participating in its Supplemental Retirement Program to take a buyout for what would amount to about 64 cents on the dollar. By following other public pension systems into what amounts to a default – albeit partial – JeffCo Public Schools join the parade of cautionary tales for those relying on the promises of public programs like PERA. As Glenn Reynolds of Instapundit is fond of reminding us, promises that cannot be kept, won’t. The Supplemental Retirement Plan was created in 1999 for employees who worked in full-time or job-share positions which were covered by an association. It was designed to replace a bonus-type program for retirees who met age and service requirements, with a tax-advantaged vehicle. Benefits are intended to supplement, not replace, PERA retirement benefits. Participation in the plan was immediately frozen upon its creation. The District had originally committed to fund $90 million dollars toward a combination of pension plan benefits and sick and personal leave payouts at a rate of $9,000,000 per year for 10 years. However, budget cuts reduced the annual plan contributions and stretched out the plan’s original funding timetable. The plan has been underfunded since its creation. In 2007, the District purchased certificates of participation and deposited the funds into the plan for the purpose of meeting its stated funding obligations and has now exceeded its original funding commitment. Further contributions to the plan are not likely to be made. Subsequently, existing retirees and employees who met the full vesting requirements of 20 years of eligible service and age 55 were offered a one-time ability to have their benefits satisfied with a lump-sum payout at the plan’s stated discount rate. As a result, participant count, liabilities and assets have decreased in the plan and the overall funded status of the plan has improved. It is anticipated that at some point the plan will need to declare actuarial necessity and terminate or reduce plan benefits for non-vested participants. After the lump-sum payouts, the plan amended its investment policy to be more conservative, in an effort to protect the funding of benefits for existing retirees and vested participants. The plan wasn’t underfunded for lack of district contributions. According to the latest available plan financials, also from 2009, the district met or exceeded its annual contribution every year until 2009, with the exception of a slight shortfall in 2004. The combination of payouts and lower-than-necessary returns kept the plan funding under 32%, until the 2006 issuance of $37 million of Certificates of Participation (more about that in a coming post) reduced the outstanding obligations starting in 2007. As of the 2009 report, the plan had $20.8 million in obligations, $7.4 million of which were unfunded. There appear to be a number of significant transparency issues with the way the plan has been handled. The November 8 meeting itself raises issues of transparency and obligations of full disclosure to the public. The meeting discussion was held in a 45-minute executive session. Executive session is supposed to be reserved for legal advice, not for general discussion of motions before the Board. It is unthinkable that the Board received a 45-minute legal briefing, after which it proceeded directly to a vote. There is, evidently, case law to suggest that the recording of the Executive Session should therefore be made public, since the session – although not the vote – were conducted in violation of statute. The most recent financials available online date from 2009, three years ago. Even in the absence of significant financial changes, plan financials from the most recent year should always be available. Also note that the teachers were offered a buyout in 2006 – which the smart money, including current Superintendent Cindy Stevenson took – the 2009 statement RFP for a plan financial advisor all but admits that the plan will terminate and default on the remaining obligations at some point. Whether or not this likelihood was made clear to the teachers who chose to remain with the plan in 2006 is unclear. What it clear is that Stevenson, and possibly current Board member Jill Fellman, were made whole during the 2006 buyout offer, while other teachers were not. The funded ratio has fallen to 50.6%, and the unfunded liability as of August 31, 2010 is $8.8 million. Correction: No vote was actually taken at the November meeting. (I left early because of the descent into executive session.) It is likely that there will be a vote at the December or January meeting. Stay Tuned. Susie and I went to New England for a couple of weeks this summer. It’s a part of the country I had never really been to before, which meant that I probably tried to cram too much into the two weeks. Hey, you never know when you’re going to be back – maybe never. 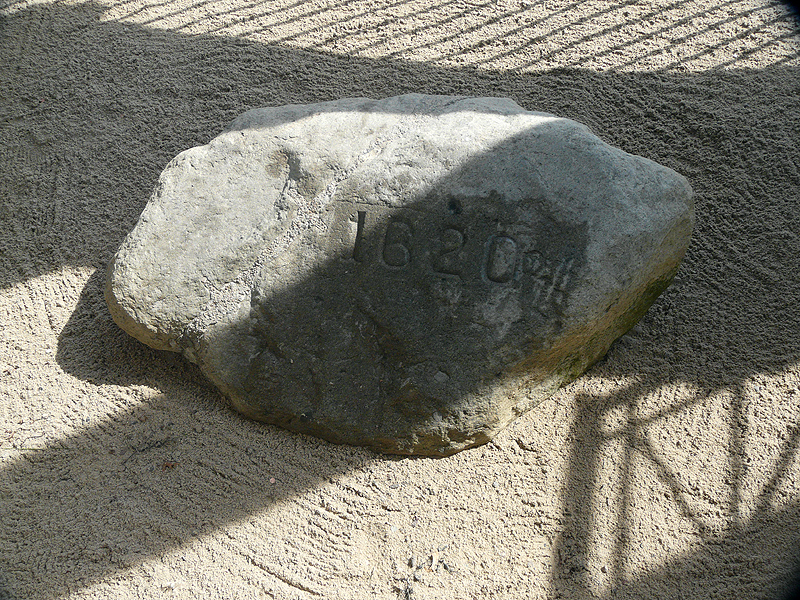 So what’s the point of driving from Cape Cod to Bah Hahbah, and not making a brief pit stop at Plymouth? …things don’t go so well for them, so the Indians step in, help out with food and local know-how, and everyone celebrates together. Hey, it’s a free country. 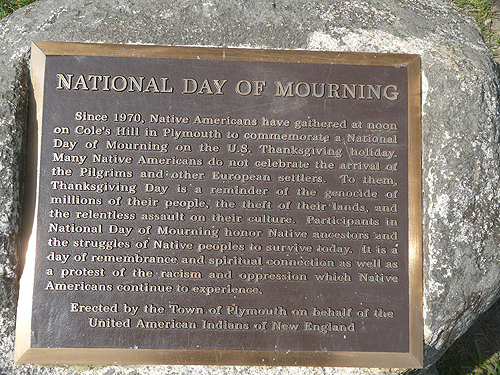 This group of Indians want to come to Plymouth and mourn the fact that they ended up dealing with the English rather than the Spanish, I guess that’s their right, but it’s shame that the 1998 settlement had the city of Plymouth put up a plaque celebrating that. This is where it started, the northern part at least, and it’s wrong that the city where it all started is coerced into turning the holiday into another excuse for an apology for success and constitutional government. It’s wrong to say that America was founded by capitalists. In fact, America was founded by socialists who had the humility to learn from their initial mistakes and embrace freedom. 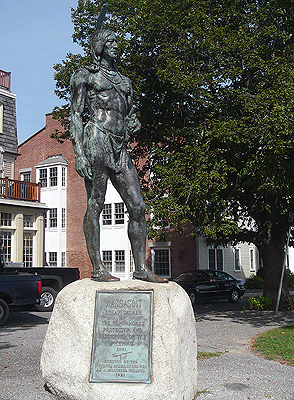 One of the earliest and arguably most historically significant North American colonies was Plymouth Colony, founded in 1620 in what is now known as Plymouth, Massachusetts. As I’ve outlined in greater detail here before (Lessons From a Capitalist Thanksgiving), the original colony had written into its charter a system of communal property and labor. As William Bradford recorded in his Of Plymouth Plantation, a people who had formerly been known for their virtue and hard work became lazy and unproductive. Resources were squandered, vegetables were allowed to rot on the ground and mass starvation was the result. And where there is starvation, there is plague. After 2 1/2 years, the leaders of the colony decided to abandon their socialist mandate and create a system which honored private property. The colony survived and thrived and the abundance which resulted was what was celebrated at that iconic Thanksgiving feast. Perhaps not surprisingly, I really had no idea about this part of the story until I read about it in the Wall Street Journal about 10-15 years ago. The story I heard was the one that essentially leads to the conclusions at top: the Indians saved the day, and other than the nice meal, have been regretting it ever since. The whole part about the communitarian experiment gone wrong – is there any kind that goes right? – somehow slipped everyone’s mind. It’s right there in Bradford’s journals, as Bowyer point out. Instead, we spent a couple of months rehearsing the class play, an adaptation of Witch of Blackbird Pond. This is a shame not just because it passes up a chance to teach an obvious lesson about economics and human nature. It also misses a chance to point out the roots of our Constitution. (Honestly, everything before 1787 should be taught as a lead-up to the Constitution. There’s a reason they wrote what they did; it didn’t just come out of nowhere.) The colonies really were different in outlook. New York was founded as a commercial colony. 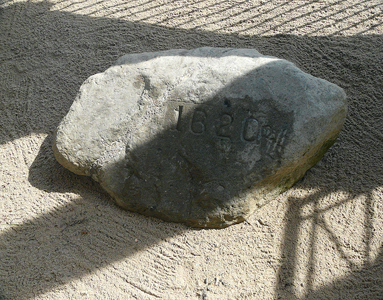 Massachusetts wasn’t and the Puritan ethic echoes still. Federalism wasn’t just a matter of keeping the federal government in check, it was also a way of respecting different outlooks on life. So let’s remember and be thankful that, for the fact that, even with all the unfortunate changes over the last few years, we’re still living in the only country founded on an idea, and hope that over time, we can find our way back to it. Now, the One Big Unpleasant Fact is that Obama got re-elected, and will be President for the next four years, with all that means. Make no mistake, the administration and the rest of the institutional left talk of “consensus” to claim mandates far beyond what the public actually bestowed, and will attempt to portray opposition as racist. It will pursue its agenda through aggressive rule-making. It will reward friends, punish enemies, seek revenge, punch back twice as hard, bring guns to knife-fights, and will continue to consider us, fellow citizens, as the only real enemy. But the facts that conservatives cited during the campaign don’t cease to be true, just because of the election. None of this changes. None of this is any less true today than it was yesterday. All of it needs to be repeated. Joe Biden may mock math, but math will have the last laugh. It’s our job to make sure that that laugh is on him, not us. Our arguments in favor of civil society over Big Government, of individual freedom over bureaucratic diktat, of rights-as-individuals over rights-as-groups are still as valid as ever. Their truth isn’t diminished by an election, or even by a series of elections. The Republicans didn’t lose any ground in the House, and every Republican Congressman who was elected can honestly say that they were elected to keep taxes low and cut spending. Their seats and their half of Congress are no less legitimate than the Executive branch. There’s no reason we can’t be personally gracious to our friends who are Democrats, but politically as generous as the Democrats are when they lose. After all, facts remain facts. Much of the election this year has focused on the suburbs, or, as Joel Kotkin calls them, “America’s last politically-contested territory.” Republicans have attempted to appeal to their economic concerns over mounting debt and the threat of joblessness to their middle-class security. Democrats have attempted to appeal largely to their independent women’s vote, focusing on reproductive issues. But there’s another reason for suburbs to be wary of a second Obama term – the possibility that they’ll be denied the benefits that they moved to the suburbs for in the first place. Stanley Kurtz, a fellow at the Ethics and Public Policy Center, has written a book, Spreading the Wealth, about Obama’s desire to remake the political structures of metropolitan areas, to tie suburbs governmentally to the cities at their urban core through regional arrangements. Such arrangements would, in Kurtz’s estimation, act both to shore up the Democratic Party’s urban base and political machines with suburban tax dollars, and align the political interests of the suburbs with those cities, as well, making them more dependent on federal largesse. “At some point, these are real political fights. And I think that you can’t avoid the fact that there are winners and losers in the current economy, in the current way that we arrange local government, zoning issues, land use, and so forth. And that if we’re going to change these systems, then somebody’s going to be resistant, because somebody’s benefitting from the current structure. But the question is whether we can patch together coalitions that can win, particularly at the state level. “One of the things that’s interesting to me – I’m relatively new to state government – but I think that when you look at some of these issues, state government has not picked up the ball in terms of moving in, and not micromanaging what happens at the local level, but providing some basic parameters, particularly around issues like transportation where the state is pouring a huge amount of money. “A major reason people move out to the suburbs is simply to be able to buy their own government. These people resent it when politicians take their money and use it to solve other people’s problems, especially when they don’t believe that government can actually solve those problems. Two streams of opinion seem to be feeding the anti-government consensus as American politics enters the suburban era. One is resistance to taxes, which is strongest among middle-class suburban voters. The other is cynicism about government, which is strongest among the urban poor and the poorly educated. “Upscale voters are the most likely to say that government has too much power and influence, that taxes should be kept low, and that people should solve their problems for themselves. That’s the ‘elitist’ suburban view. Downscale voters express doubts about what government can do. They are the most likely to say that public officials don’t know what they are doing, that most of them are crooks, that they don’t pay attention to what people think, that government is run by a few big interests, and that you can’t trust the government to do what is right. That’s the cynical, “populist” view. Put the two together and you have a powerful, broad-based, anti-government, anti-tax coalition. That was twenty years ago, and while Kotkin argues that the suburbs have become more competitive politically, it’s also true that the reasons people move there in the first place have a lot to do with dissatisfaction with and distrust of urban government and political machines. Schneider goes on to note that these qualities of wanting to “buy their own government” obtain regardless of the race of the voter. Black suburbanites feel the same way that whites do about that. And it’s quite likely that the growing Hispanic and Asian suburbs share many of those views. Kurtz argues that Obama would leverage federal dollars to push those collar counties into regional government arrangements, subverting and replacing the statutory and chartered city/county structures that we have now. The would likely be done through the creation of special governmental structures, like RTD, where the cities and suburbs would have some leeway in how they cooperated, but whose boards would be elected outside traditional city & county authorities. The sales pitch is that since the Denver Metro area, for example, needs to function economically as one unit, it should also function politically as one unit, and that infrastructure and education and housing decisions should be made regionally. I remember reading a Sunday opinion piece in the mid-80s – I can’t remember if it was in the New York Times or the Washington Post – arguing that political structures need to be on the same scale as economic ones. There’s some merit to that. The US prospered in large part because the Commerce Clause made sure that the country was essentially one large free trade zone, with uniform laws when the commerce crossed state lines. Thinking regionally makes sense in certain obvious cases. Cars don’t stop at a city or state lines, for instance, but buses often do. 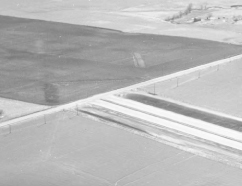 At the eastern terminus of the Kansas Turnpike, the rest area features a picture from the road’s construction, showing it ending at surface level in a farmer’s field in Oklahoma. A lack of coordination between the two states did that, although the highway was eventually completed. And Maryland is still standing in the way of both a Western Bypass and an Eastern Bypass to the Capitol Beltway, projects that anyone looking at a map can see make simple common sense for an area drowning in traffic. One frustration of living in Omaha for the year was the lack of regional bus service. RTD has unified bus service around the Denver region, and because of partial privatization, has plenty of suburb-to-suburb routes that avoid the city center altogether. But what Obama is proposing in the clip above is something far more widespread. Schools? Housing policy? We may all be in this together, but Colorado has the idea of local control of school built into its Constitution, we feel so strongly about it. How ought they react that they need to subsidize the Denver teacher’s union? After initially demanding a part of the federal pie in return for providing “affordable housing,” they would find themselves unable to break free. Worse, allowing Denver to export high-density housing to the suburbs is not merely a lifestyle issue, it’s also a political one. Jonathan Rodden has conducted considerable research showing that in the United States and indeed, throughout the Anglosphere, high-density housing areas, even at the precinct level, reliably and overwhelmingly vote significantly to the left of surrounding lower-density housing. These results appear to be largely independent of income level, so it’s not simply a matter of the urban poor voting Democrat; the urban rich do so, too. Extending “affordable housing,” which is almost always higher-density, into the suburbs, would infiltrate those voting patterns into this battleground area. Localities would find themselves with less and less control both over the services they are expected to provide, and with less and less control over the taxing policy to fund those services. They would find themselves more and more dependent on state and federal funding, and thus more subject to federal and state rules. As power flowed from chartered cities and counties to these regional bodies, the rules under which they operate would also become less accountable to local control. And the flow of money to services, and the public employee unions, would become increasingly political, as the region’s government began to resemble urban machines. Any sensible suburbanite should immediately see a threat to the very things he moved to the suburbs to enjoy, and feel pursued by the dysfunctions that he moved away from the city to escape.